Cortisol is your body’s stress hormone, best known for its ability to induce a fight-or-flight response and a temporary increase in energy production when we are in danger. How might Adrenal/ Cortisol issues affect a child with vaccine injury / autism? Or vice verse, high cortisol levels predispose a child to vaccine injury/ autism? According to Jonathan Tommey, of the 780 autistic children they have tested, all had adrenal stress. And according to this scientific study: Autistic children have imbalances in many neurotransmitters and hormones, and in a subset of autistic children this includes high cortisol levels (article here). And ASD children are stereotypically known to react abnormally to change (meltdowns when you change routine, move furniture, OCD tendencies, etc). The scientific article above also refers to studies showing that circadian rhythms are abnormal in autistic children (many parents report that their child’s sleep patterns changed following vaccination). According to this article, high cortisol levels can: lower the liver’s ability to detox heavy metals and chemicals; negatively impact an individual’s ability to fight off infection at the first line of defense; and compromise the Natural Killer Cells, responsible for protecting us against chemicals and infectious agents. 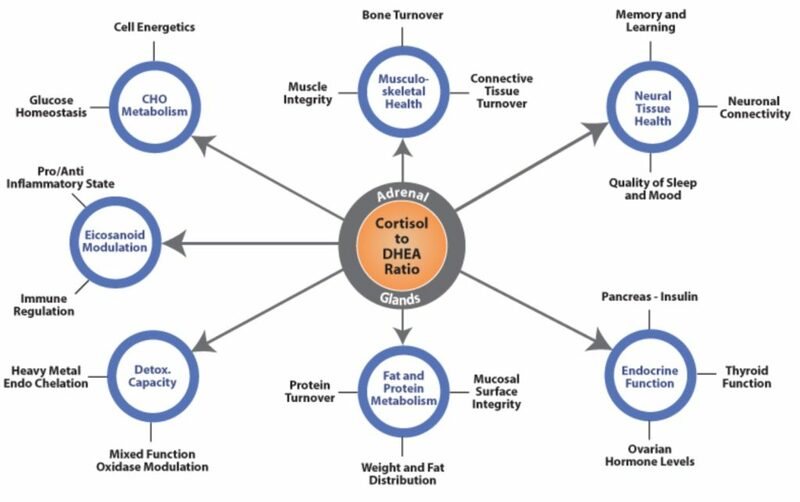 Here is a great explanation of Cortisol and DHEA (found in fish oil). The importance of healthy cortisol and DHEA levels to your well-being cannot be exaggerated. Too much cortisol can literally burn up the cells of the body; insufficient cortisol production can slow or stall critical processes. What is a healthy cortisol level? Simply put, a healthy level is an adequate amount required to optimally run all the bodily functions under its control. Cortisol and DHEA are produced in the adrenal glands under the stimulation of adrenocorticotropic hormone (ACTH), which is produced by the pituitary gland. The pituitary resides close to the brain, taking all of its cues from the brain’s powerhouse, the hypothalamus. The biggest red flags that may signify the need for cortisol-balancing herbs are the heightened fight-or-flight response, and abnormal or exaggerated reactions to stress. For examples from my own life, my 6 year old daughter’s fight-or-flight was sometimes unreal. One day she left the bathroom, and I followed behind when the cold air startled her. She swiftly turned around, screaming and clawing her way through me to get back into the warm bathroom, dropping herself to the floor in tears, and if I got near her, she became aggressive. Another incident was when I moved a bookcase one foot away from the wall. She attempted to put the bookshelf back, but when pushing was no use, she attempted to pull the bookcase and everything on it, down – on top of the both of us. I stood between her and the bookcase as she tried to push through me, arms and legs flailing wildly, she was out of control. We found Adrenal Edge by accident. I began it for the purpose of off-setting any adrenal stress caused by chelation (heavy metal removal). However, I noticed my daughter began to smile more – a lot more. So we started taking it every day and saw dramatic results in her mood, her outbursts, and her ability to handle changes. Remember that book case incident I mentioned? Well, we moved another piece of small furniture a couple weeks after we began the Adrenal supplements and this time instead of a wild animal, her response was “I don’t want to see it, I’m not ready.” An hour later she saw it and was fine. Most often she handles the most stressful things with only a few minutes of anger, or sitting by herself (angry but calm). Remember, all kids have emotions they can’t control sometimes (like adults!). All kids get angry sometimes. Update: We added Standard Process Adrenal Dessicated and it’s made a slight improvement, but she has emotional moments so we’ve slowed it down. “Healing crisis” as they call it. But we continue with both now plus the omega 3s and have a healthy, happy child. Last week later we moved all the furniture in the dining room around. I told my husband to be prepared for days of meltdowns and to put his “patience hat” on. I informed her, and she refused to look at it for a few hours, but when she did see it she said “oh, it’s not as bad as I thought it would be” with a big smile on her face. Some other options for adrenal supplements are linked here. 4% of all amazon purchases made though this link will be donated to vaccine education and/or assistance to families who have a child suffering from autism and require expensive therapies.